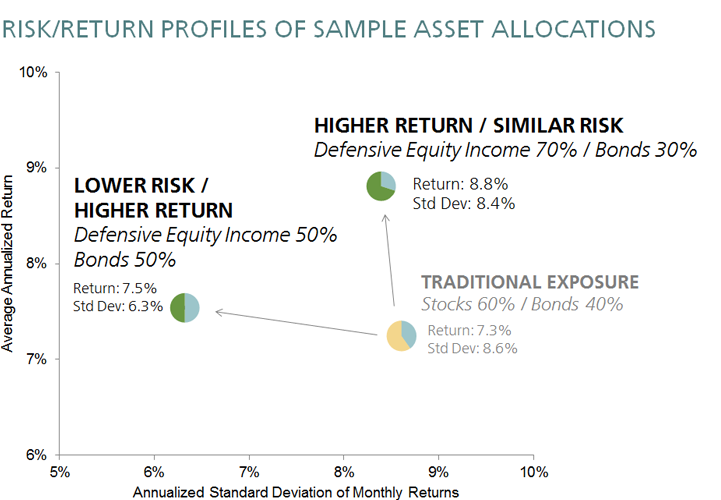 In the chart below, replacing the allocation to the traditional market capitalization based equity index with a Defensive Equity Income index resulted in higher expected returns for the same level of risk or a reduction in the level risk of the overall portfolio without reducing expected returns. By increasing our equity exposure we increased long-term expected returns without increasing portfolio volatility. By reducing our equity exposure, we decreased our long-term volatility while preserving our long-term return. Defensive Equity Income allows investors to stay invested in equites and may offer more income and potentially less downside than traditional market-cap equity allocations. Source: QS Investors; Zephyr StyleAdVISOR Traditional Stocks represented by the Russell 3000 Index. Bonds represented by the Bloomberg Barclays US Aggregate Bond Index. Defensive Stocks represented by the QS Low Volatility High Dividend Index; The QS Low Volatility High Dividend Index was launched in December 2015. Data prior to the launch date is back-tested data (i.e. calculations of how the index might have performed over that time period had the index existed). There are frequently material differences between back-tested performance and actual results. Past performance -- whether actual or back-tested -- is no indication or guarantee of future performance. The Index was calculated jointly by Solactive and QS Investors. Solactive is paid by QS Investors. This material was prepared without regard to the specific objectives, financial situation or needs of any particular person who may receive it. It is intended for informational purposes only and it is not intended that it be relied on to make any investment decision. It does not constitute investment advice or a recommendation or an offer or solicitation and is not the basis for any contract to purchase or sell any security or other instrument, or for QS Investors to enter into or arrange any type of transaction as a consequence of any information contained herein. QS Investors does not give any warranty as to the accuracy, reliability or completeness of information which is contained in this document. Except insofar as liability under any statute cannot be excluded, no member of QS Investors, or any officer, employee or associate accepts any liability (whether arising in contract, in tort or negligence or otherwise) for any error or omission in this document or for any resulting loss or damage whether direct, indirect, consequential or otherwise suffered by the recipient of this document or any other person. This document is only for professional investors. No further distribution is allowed without prior written consent of QS Investors.